Underlying property fundamentals in Singapore improving with office sector leading the way. Pressure on rents easing as supply tapers off and leasing enquiries pick up. Opportunity to accumulate S-REITs as the overhang from potential large equity raisings has likely passed. Top picks: AREIT, CCT, CDREIT, FCT, FCOT and Suntec REIT. Rotation amongst S-REITs as the market digests recent equity raisings. S-REITs have raised close to S$4.0bn (excluding IPOs) in the last 5 months, which has been one of the busiest periods for S-REITs since 2011. Most of the proceeds have been channeled into acquisitions, which cements a steady 1-2% rise in DPU over 2018-2019. However, since April 2018, the SREIT index is down 2.4% (including distributions) partially attributed to investors pricing in the impact of four rate hikes (vs three previously), and also rotation among various S-REITs in view of the strong take-up seen in recent fund raisings. Looking ahead, while the timing of further fund raisings is hard to predict, we believe the majority of the large equity raisings are likely behind us. With nascent signs of a sustainable recovery in the Singapore property market boosted by an inorganic strategy, in our view, should result S-REITs in rallying with yield spreads compressing to 3.0% from 3.4% currently. 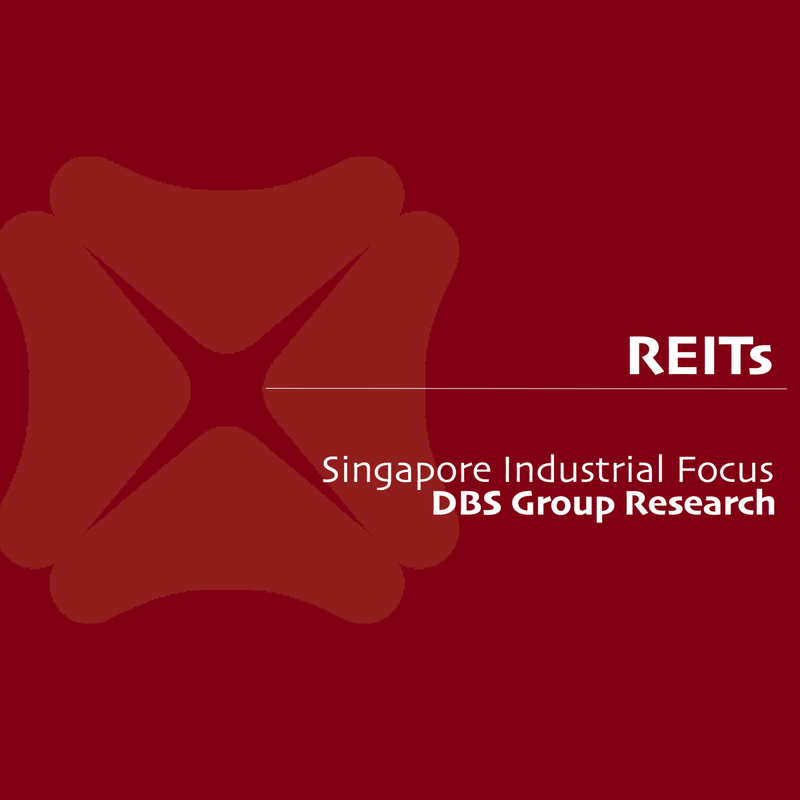 The muted S-REIT performance and y-o-y decline in DPUs for several REITs owing to the negative impact from the oversupplied market over the past few years belies the turnaround in the Singapore property market. Leading the way is the office sector with Grade A CBD office rents rising faster than expected to S$9.70 per square foot per month (psf/mth) (+3% q-o-q; +8% y-o-y) and close to our year-end target of S$10 psf/mth. Leasing enquiries have picked up and this trend is also starting to occur in the industrial sector. The retail sector, which many investors have shun, is showing green shoots with a rebound in retail sales; and CMT reported positive rental reversions in over a year. Finally, hotels in Singapore are reporting a y-o-y increase in revenue per available room (RevPAR) for the first time in over two years. Time to accumulate selected office and hotel names. With the office and hotel sectors improving on easing supply pressures, we believe it is time to accumulate CapitaLand Commercial Trust (Target Price: S$2.10), Suntec REIT (Target Price: S$2.30), Frasers Commercial Trust (Target Price: S$1.65), and CDL Hospitality Trust (Target Price: S$2.00). We also like Ascendas REIT (Target Price: S$3.00) given exposure to the potential turnaround of the industrial sector. Finally, Frasers Centrepoint Trust (Target Price: S$2.45) remains a favourite, given strong near term DPU growth outlook. 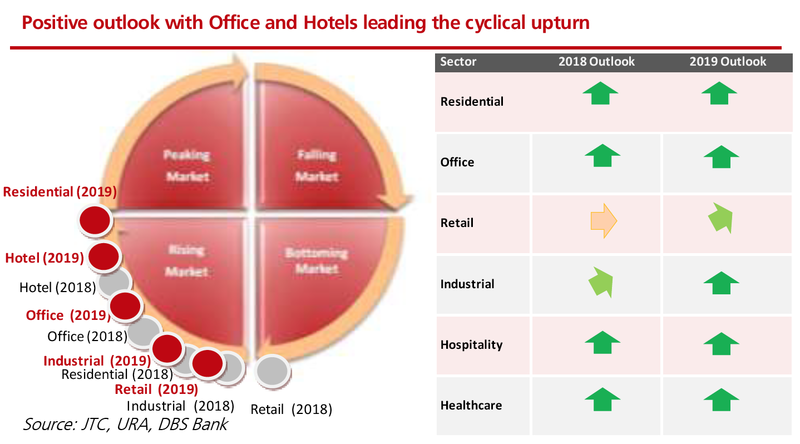 After a downturn over the past 3-4 years in various property submarkets, we believe we are at the cusp of a multi-year upturn led by the office and hotel sectors. Underpinning this positive outlook is a robust Singapore economy which our DBS economistsare projecting to grow by 3.0% in 2018 and 2.7% in 2019, and easing supply pressures. This should result in the market moving from an oversupplied situation to a landlord’s market. Given our preference for the office and hospitality sectors, in the large-cap space, we prefer CCT and Suntec. For the mid-cap REITs, we like CDREIT and FCOT. We also like the large-cap industrial REITs for their steady performance. AREIT is our pick. AREIT 2.64 3.00 20% 6.1% 1.25 Steady consistent performer with scale. Overhang from lack of CEO now removed. 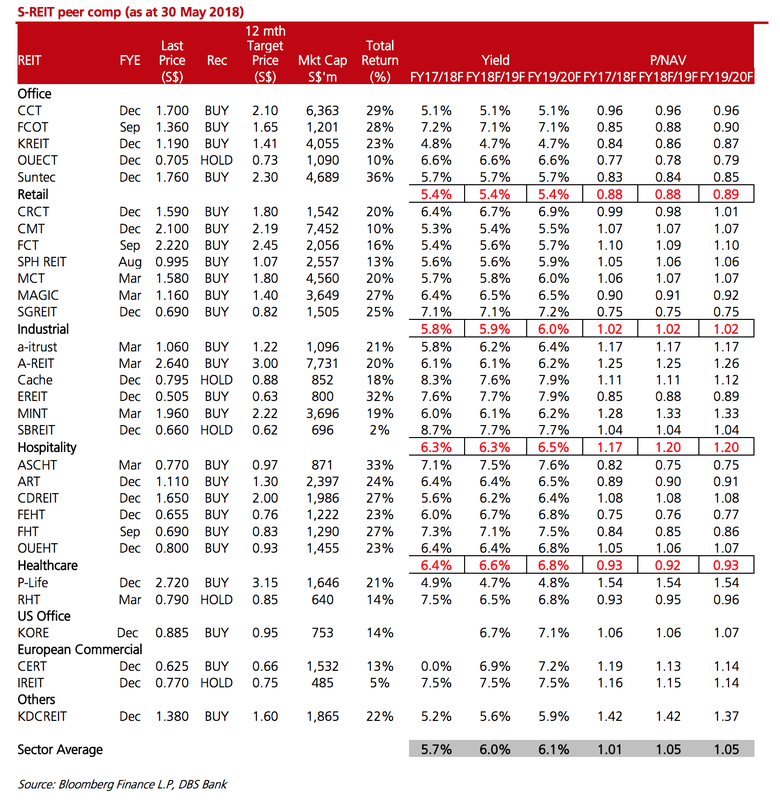 CCT 1.70 2.10 29% 5.1% 0.96 Leveraged to the multi-year recovery in the Singapore office market and trades at 1.0x P/Bk, but during an upcycle CCT can trade up to 1.2x P/Bk. Suntec 1.76 2.30 36% 5.7% 0.84 Play on the turnaround of Suntec Mall and recovery in the Singapore office market, with potential upside from a takeover. CDREIT 1.65 2.00 27% 6.2% 1.08 Leveraged to the multi-year recovery in the Singapore hospitality market. FCT 2.22 2.45 16% 5.6% 1.09 Strong DPU growth on the back of the completion of AEI at NorthPoint. FCOT 1.36 1.65 28% 7.1% 0.88 Recent expansion into the UK to kick-start FCOT’s inorganic growth strategy and allay concerns that the REIT is ex-growth. This should also reduce FCOT’s yield spread to the other office REITs from c.2% closer to the average spread of c.0.8%.